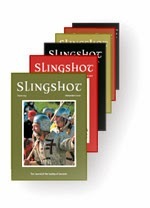 Back issues of Slingshot, the journal of the Society of Ancients, are now available at the bargain price of six for £5 (£4 for Society of Ancients members) plus shipping. That's a year's worth of Slingshots for the price of one magazine. This offer is only available until the end of June and while stocks last, so get in quickly. The bundles on offer are for the years 1982, 1983, 1984 and 1987, and for each year from 1996 through to 2010. To place your order, go to the Balearic Bundles page in the store section of the Society of Ancients website. See below for a summary of each year's highlights. Series on: Angevin armies (continued), Janos Hunyadi (continued), medieval south-east Asia. Notable articles on: medieval Ghana, ancient sea power, Picts, Hellenistic battle-standards, Constantine the Great, Rajputs, medieval Kongo, Battle Day reports (Dorylaeum). Series on: Bronze Age Mesopotamia, Macedonian military culture, Sasanian armies. Notable articles on: longbows, trireme reconstruction, Battle Day reports (Cynoscephalae and Poitiers), Spartan expeditionary forces, the ancient Macedonians. Notable articles on: Zama, ancient logistics, the Granicus, the Lombards, Battle Day reports (Callinicum), Magnesia, Cannae, Pydna, Teutoberger Wald, Heraclea, ancient Chinese expansion. That would be great. Everytime I add one to the cart it come up with a white screen saying " ALERT! Item is no longer available"
It's all working again now, so you should be good to go. Sorry about the hold up, and thanks for letting us know there was an issue.